It comes in a sheath and at a glance appears to be a survival knife. But the Ultimate Tool is more at home in the garden than the woods. Its sheath and general aesthetic borrow from military or tactical looks. Rivets, snaps, and leather on the rigid sheath hide a blade built with a half-dozen uses in mind. Grab the bamboo handle and pull it out. The Ultimate Tool is 13 inches and solid in the hand. Serrated teeth dominate one edge, a straight blade on the other side. Its stainless steel is scooped slightly, creating a trowel shape for moving earth. First released in 2015, GearJunkie got an Ultimate Tool last month to test. We’ve reviewed it for camping purposes and backyard use. The company was started by Robert Workman in 2012, the founder of Goal Zero. It designs and sells products for camping, gardening, hiking, and culinary pursuits. Beyond the Ultimate Tool, lanterns, cots, sleeping bags, flashlights, and walled tents are in the brand’s line. As a side note, I camped in an Outfitter Tent from the company last month in Joshua Tree during The Outpost, where Barebones Living erected a tent village for 200+ participants. It served as a solid shelter under the desert sun, with two bunkbed cots set up inside. Back to the gardening implement. Don’t confuse the $50 Ultimate Tool with a common hardware store trowel. 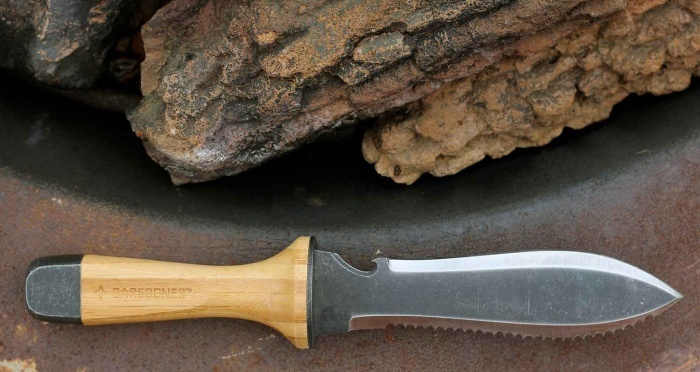 Beyond just its looks, the tool indeed borrows from features found in survival knives. Like many survival knives, it has a full tang. This means steel runs from the blade through the handle. It offers a pommel base that can pound in tent stakes. The blade comes out of the box medium-sharp. It could cut an apple or steak, but it’s not super sharp. 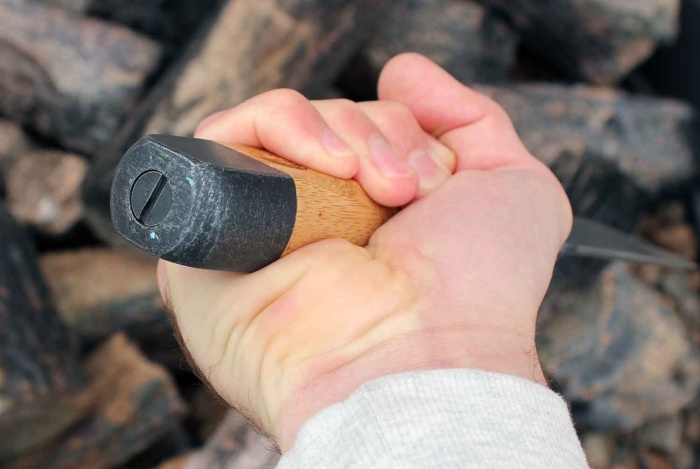 With a little work, you can hone it fine to shave kindling or slice food to prep a camp dinner. The serrated edge saws through small branches easily. Finally, a bottle opener doubles as an edged hook able to cut twine. Though it looks tactical in nature, the company actually designed the product based on the Japanese hori-hori knife. 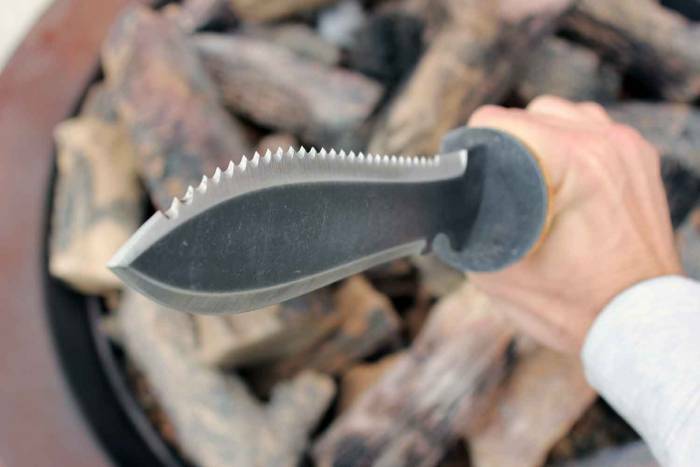 These heavy, serrated multi-purpose blades were built for gardening, digging, and cutting. Barebones includes one-inch marks on the back of the blade for planting seeds at the right depth. Its scooped shape serves for popping out weeds or digging small holes in a plot. Overall, the Ultimate Tool will serve you well in the backyard and the garden. It has all the needed features to cut, dig, trowel, pound, slice, and saw. Somewhere between a knife and trowel, the tool is super useful where digging and cutting are primary tasks. 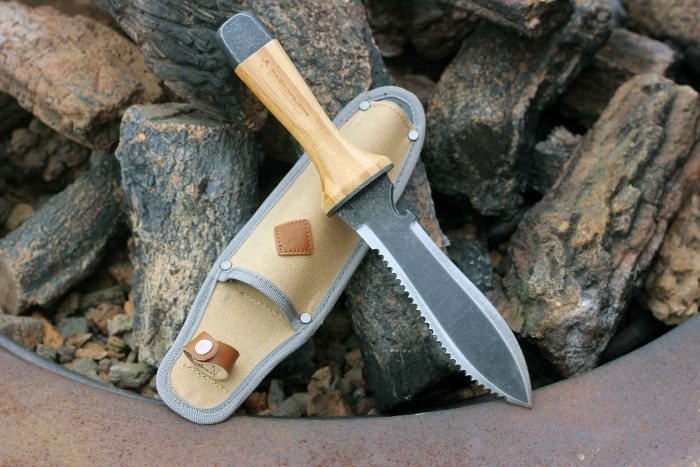 In the woods, you’ll want a more standard survival or folding knife depending on your tasks. 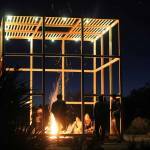 But take the Barebones Living tool camping, or use it for backyard gardening, and you’ll have a fine rugged tool around the fire pit. –See all details on The Ultimate Tool.